Garage Party: Happy New Years 2018! Red Umbrella Services wants to wish our clients and all of you a very Happy New Years! We are so thankful to be able to share the holidays with all of you and want to extend the happiest of wishes to everyone for 2018. As a premium builder of custom garages, clients often ask how to create a multi-purpose garage. Many of our clients enjoy partying and entertaining at home and garages, with only a simple upgrade, can easily accommodate your party needs even in the winter time. Host a late-night shindig for the neighborhood, or ask friends to join you in toasting in the New Year. By making it a later party you can save on the cost of food (appetizers instead of meals). Make it an adults-only party if you plan to offer alcohol and encourage your guests to hire a friendly local babysitter. Or, you can make it an all-day affair with more kid-friendly options (skip the booze, add some sweet treats) during the day and more adult-centric at night. Tell your friends that your Garage Party is open all day and they can come by whenever they have time. Enhance the festive feel of the season with a ‘Winter Wonderland’ theme. Use tinsel and craft snowflakes inside the garage, with twinkling Christmas lights and glow-stick chandeliers. Spray paint old decorations with a frosty finish and use white poinsettias as centerpieces on your table. Have a bonfire or fire pit outside. Make sure to have plenty of chairs available. Encourage as many people to sit around the fire, to keep warm. If you really want to kick up your heels, you can build a portable dance floor. Check out some of the following videos for instructions! If you’re going upscale, offer petit-fours from a local bakery or spend the weekend before New Year’s making your own confections. Serve champagne jello shots with edible glitter at midnight. Or drop glow sticks into the punch barrel. There are many caterers in Eugene who can help you design an affordable hors d’oeuvres menu. 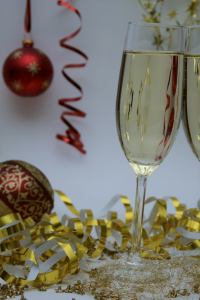 We recommend serving a minimal amount of alcohol (some guests will need to drive home) so offer a non-alcoholic version of bubbly to your designated drivers. Serve a signature drink (limit 2 per person) to everyone else. And have Uber or Lyft on standby just in case! Remember: alcoholic drinks with sugar (fruit or juice) will cause your blood alcohol level to rise significantly. From all of us at Red Umbrella Services: Thank you for sharing 2017 with us and we are looking forward to many more good times in the coming year. Happy 2018!